For extra small dogs (under 10 lbs). Designed to keep your small dog feeling comfy and safe. These three level condos provide a birds eye view. For ferrets and medium to large birds. Small birds and other exotic pets. Housing and dishes must be provided by owner. To view a Photo Gallery of boarding accommodations Click Here. Creature Care requires that you bring your pets' regularly fed food and treats to help reduce digestive upset. Meals will be served according to your instructions. There is an added fee for administering medication. Recreation yards are kept safe and secure with well maintained fencing, gates and covers. Having multiple yards insures that your dog will have plenty of opportunities for exercise. Your dog will have access to the recreation yards a minimum of four times a day. Dogs are not allowed access to the recreation yards if there is no supervision on the premises. Would you like your dog to be bathed before pick-up? See our available spa services and schedule your pup for a bath or more while making your reservations. Creature Care adheres to a strict cleaning schedule for the well being of your pet. All Suites and Condos are cleaned every morning and throughout the day. Clean and dry bedding will be maintained throughout your pets stay. A variety of soft music is provided for your pets' listening pleasure as they lounge in the sun, or relax on a carpet tree top. Birds will enjoy daily matinees during their stay. The opportunity to stretch their wings and receive a water spritzing is available per your request. Pick up & Drop Off hours: Monday to Saturday 8:30 a.m. - 12:00 p.m. & 3:00 p.m. - 5:00 p.m.
Sunday afternoons 3:00 p.m. - 5:00 p.m.
Is your pet current on all required vaccinations? Has your pet boarded with us before? First time guests must pre-register. This consists of filling out paperwork and obtaining valid vaccination records. Examples: Administering Medication, Physical Assistance, etc. Creature Care wishes to accommodate special needs whenever possible and will need to know what these are advance. Prescription medications must be in labeled containers with the medication name, dosage, administration instructions, and name of the Veterinarian that prescribed it. At least two extra days worth of medication should be included. ​An extra fee will be added for medication administration. "Security items" are encouraged to help make your pets stay more comfortable. Every effort is made to care for all items during your pets stay, if you have any bedding that requires special treatment or cannot be washed, please notify us at check-in or while making your reservation (We cannot guarantee all toys will be returned). 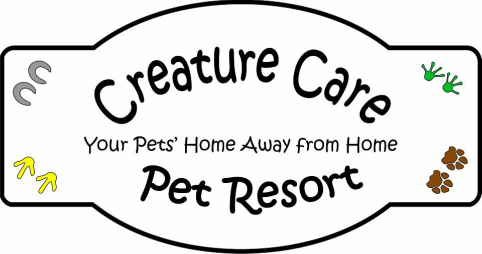 Creature Care requests that you bring your pets regular food and treats, in order to reduce digestive upset during their stay. What if questionable behaviors, health conditions, or injuries appear during your pets stay? 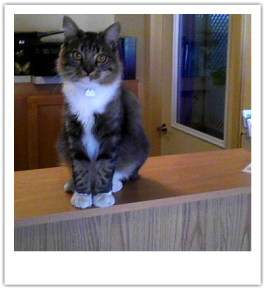 Our Veterinary Technician will be notified immediately. Medical guidelines have been established for the safety and well being of all boarders. If anything of a serious nature occurs you and your Veterinarian will be notified and immediate action taken.